Klingenberg, February 2019. 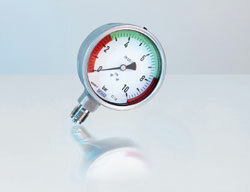 An individual red-green marking on pressure gauges and dial thermometers is now also possible using an adhesive label. WIKA offers a corresponding set of arcs for nominal sizes 63, 100 and 160.